Doctors in the process of dismantling a stereo system say meth can, in fact, be very good for you. CAMBRIDGE, MA—Challenging a growing scientific consensus over the dangers of methamphetamines, a team of doctors frantically prying apart and dismantling a stereo system released the findings of a new study Friday concluding that the synthetic drug actually isn’t really that bad for you. Speaking from a filthy, trash-littered basement in an abandoned building near Boston’s Mt. Auburn Hospital, the group of pallid physicians told reporters their research provides striking evidence that the psychostimulant has been erroneously classified by the medical community as a dangerous substance, when it in fact has few discernible downsides. 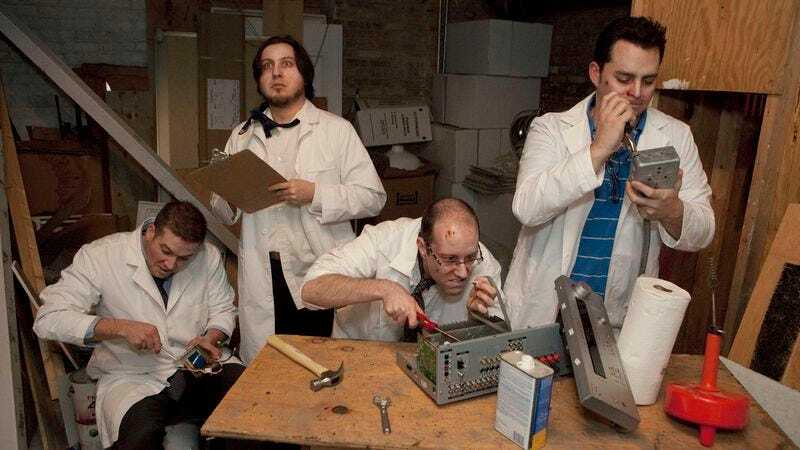 The four medical professionals ripping wires out of a stereo receiver and inspecting it for hidden surveillance devices also maintained that meth, in fact, may actually be quite good for you. According to the doctors’ research, which was conducted over the past straight 96 hours, methamphetamine and its derivatives confer a wide range of benefits to users. During trials on subjects between the ages of 50 and 53, for example, the team found that small amounts of crystallized meth were shown to drastically improve mental processing, physical strength, and emotional experience, effects that only intensified as doses of the drug were increased. In one particular study conducted on a 51-year-old male subject, researchers observed the drug produce a range of positive side effects allowing the subject to organize an entire closet full of scalpels, make important discoveries about friends’ medical histories, and discern formerly imperceptible diseases and bacteria festering within public spaces. Doctors confirmed that if you use the “really good, high-quality stuff,” the effects are even more pronounced. Doctors stressed that though their findings were potentially groundbreaking, more comprehensive research cannot be published unless the results are repeated in subsequent experiments. Thus, after the team has successfully opened a subwoofer and removed its magnet, which they hope to sell in order to finance their research, they then plan to conduct further trials. When asked about their hopes for publication and peer review, doctors said they are confident—extremely, incredibly confident—that their research will eventually reach a wider audience. At press time, doctors were staring intently at a pile of screws.